2018 was a year of relative resilience for mergers and acquisitions in the marketing and media sectors. Full-year activity declined only gently against last year according to Kingston Smith’s Marketing & Media Deal Tracker. With 273 deals recorded for the year, deal volume is down by approximately 1.5% on 2017, which itself was down around 6% on 2016. To have maintained activity levels in the face of increasing Brexit uncertainty may be testament to the strength of appetite for the sector. However, we do expect 2019 to see a slowdown in deals as Brexit worries combine with wider global economic uncertainty to put the brakes on deal-doing. Cross-border activity remained steady at around half the deals recorded; although economic prospects are currently dampened by uncertainty, a weak pound makes UK businesses even more attractive to some buyers. Growth forecasts for Britain’s economy are low given the uncertainty around the form or timing of Brexit. This is also due to the general nervousness about some of the powerhouse economies of Europe who may be facing recession, a slowdown in China’s growth and a continued government shutdown in the US. Our preliminary data suggests Q4 saw the lowest number of deals, consistent with each of the previous three years. It means full-year figures saw the decline since the EU referendum in 2016 continue, with activity levels slipping each year. That the drop remains gradual despite accelerating economic headwinds points to the hunger of acquirers, which may have been pushing deals through ahead of any firm economic shocks hitting and adversely affecting the market. 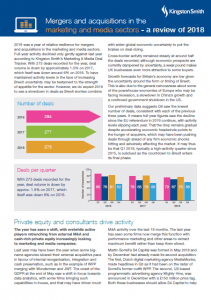 It may thus be that Q1 2019, typically a high-activity quarter since 2015, is subdued as the countdown to Brexit enters its final phase.